Face wipes constitute one of makeup removal methods. Obviously, as any other, this method has its supporters and opponents. Learn what face wipes are, their types, pros and cons. A type of face wipes has to match either skin type or makeup type. It’s worth pointing out that face wipes for normal skin type, despite collecting makeup, deliver moisture to skin and mattify it. Face wipes designed for dry skin are rich in oils which are to moisturise and restore the natural hydro-lipid barrier. Oily skin type face wipes are mostly designed to cleanse skin, remove excess of sebum and mattify skin. When it comes to combination skin face wipes, they don’t only remove sebum and mattify skin but also moisturise and restore the natural hydro-lipid barrier. 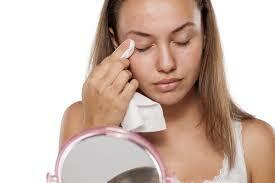 Face wipes for acne skin type feature antiseptic substances and help skin to remain matte. They remove impurities form skin and microbes which lead to inflammations. Mature skin face wipes contain substances that fill in wrinkles and delay skin-ageing processes. The very substances are face skin oils such as argan oil or coconut oil as well as vitamin E. Allergic-prone skin type face wipes are deprived of alcohol and many chemical substances; instead they are reach in natural substances. Similar composition and properties are characteristic for irritated skin face wipes. 3. The third criterion for face wipes types is the makeup itself. Specially for waterproof makeup there are special face wipes developed which remove this water resistant cosmetics without leaving stains on skin. Face wipes is a ready solution to get rid of makeup. It successfully replaces either micellar lotion or face milk along with a pile of cotton pads. For that reason, face wipes save up room and are lighter to carry. Moreover, they won’t get damaged when brought from one place to another (e.g. while travelling). Face wipes can cause blackheads and acne due to their high synthetic substance and preservative content. Moreover, they get dry very fast in the package and every single opening lets bacteria access the product easily.